Interior Design Story: Unforgettable Play Area for Kids: the "At Play Cafe"
Unforgettable Play Area for Kids: the "At Play Cafe"
Today we'll visit the "At Play Cafe" by "Kidtropolis". 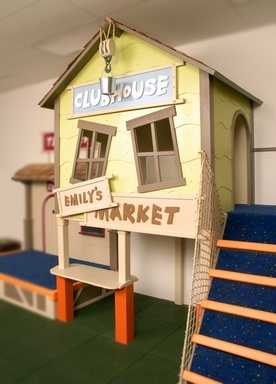 As you remember, it's a very creative company that makes custom furniture for kid's rooms. The "At Play Cafe" is designed to fit the lifestyle and interest of the most freakish children. It is built as a small village where the kids have their own market, firehouse and theater. Do you remember yourself as a kid pretending to be a singer or a salesman? You can give your children a holiday for every day to bring something like it into your home! Why not? Be sure: your kids will surely appreciate it. And another essential aspect is the safety of your kids. You should definitely take it into account when creating the play area. 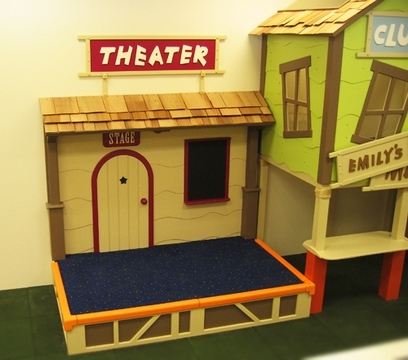 As they say at "Kidtropolis", "each corner of this structure has been thoughtfully reviewed to ensure that a fun time can be had without concern for harm, edges have been covered or rounded and each element has been added or customized to be safe for all ages".